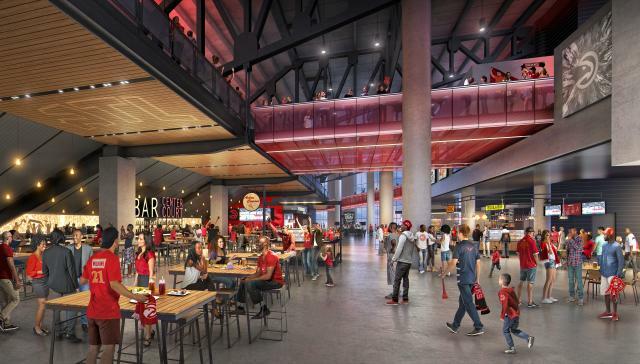 For their 50th anniversary, the Atlanta Hawks aim to reimagine the fan experience with updated seating, food options, bars, suites, and more. Watching a game at the arena will be different than any other building in the NBA, including a scoreboard three times the size of the current scoreboard. Most people celebrate 50th anniversaries with gold, but the Atlanta Hawks aren’t like most people. Attuned to the city’s innovative thinkers, its fast-paced culture, and its inherent warmth, the team, for its 50th year in the city, aims to reimagine two of Atlanta’s greatest assets—city life and Southern hospitality—under one roof. 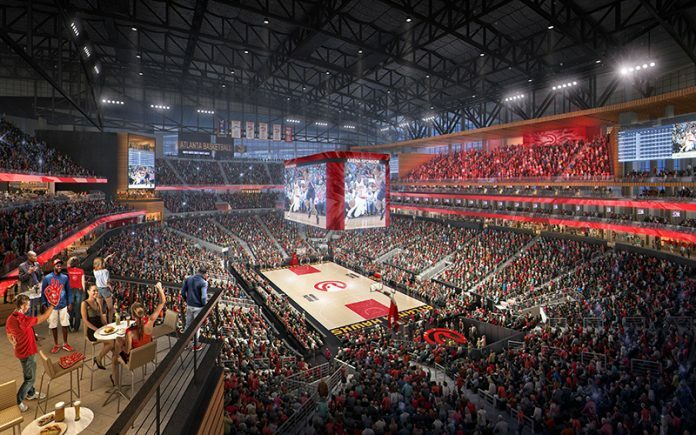 In June, Philips Arena, the Hawks’ longtime dribbling grounds and host of approximately 170 events per year, unveiled its $192.5-million plan to reconfigure the Downtown venue into a basketball-first, world-class sports and entertainment complex, complete with new restaurants, bars, and in-house attractions. Second only to the Madison Square Garden’s billion-dollar makeover, the renovation is one of the largest in NBA history and will be completed during the Hawks’ 2018-19 season. Channeling the team’s True to Atlanta mantra, the project draws on the city itself for inspiration. Take the Beltline, for instance; the arena plans to redesign its off-the-court spaces so fans can stroll through the venue like Atlantans do their city. Open, social dining areas, shops, and bars will connect concourse to concourse, offering every fan on every level greater accessibility to the arena’s endless amenities. The new arena is inspired by the Hawks mantra “True to Atlanta” and the connectivity of the Beltline. Some of those new offerings will come with familiar names attached to them. Atlanta native Zac Brown plans to extend his Southern Ground brand—known for marrying craft food-and-drink culture with philanthropy—to the Arena. 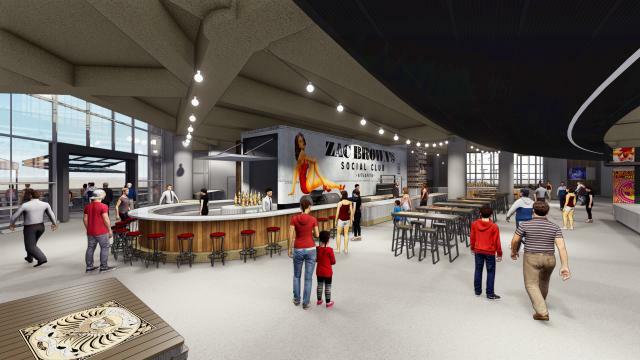 The Grammy Award-winning country singer will open up Zac Brown’s Social Club, a full-service restaurant and live-music venue, with help from HOK, the same design firm behind Mercedes-Benz Stadium. Chef Rusty Hamlin, who’s helmed Brown’s pre-concert “Eat & Greet” events for more than ten years, will take charge of the kitchen, cooking up traditional Southern eats for both the restaurant and its adjacent quick-service concession stand. Zac Brown’s Social Club will feature a live-music stage and provide an immersive dining experience. Not far off, you’ll find Killer Mike’s S.W.A.G. Shop, short for Shave, Wash, And Groom Shop. A popular barbershop and store, the original S.W.A.G. Shop is set up in the Grammy Award-winning rapper’s former neighborhood, located near Atlanta Hartsfield-Jackson International Airport. The first of its kind in a major arena, this second location will be the same as its freestanding twin—in both, you can stop in for a warm shave, a haircut, and some merch—but with one major advantage: You can watch the game at the same time. 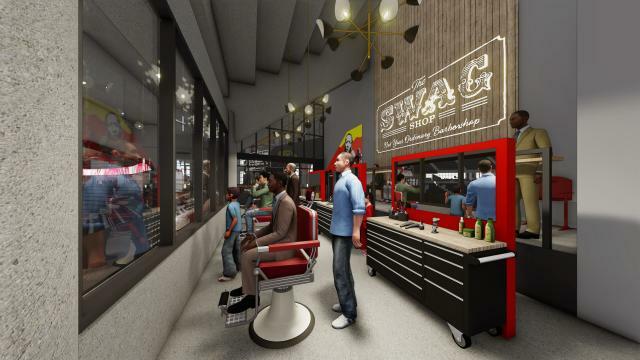 The four-chair barbershop will overlook the arena, so you won’t miss a moment of the action. At Killer Mike’s S.W.A.G. Shop, fans can get a shave or haircut while watching the game live. Not that you’ll want to leave your seat in the first place; the arena’s new views will be more fan-friendly than ever. With the removal of the venue’s six-level wall suites on the west side, the seating configuration will shift dramatically, allowing for better sightlines during games and concerts. The arena will also replace its scoreboard with one that’s center-hung and three times as large, and fans in every section will have access to state-of-the-art video pavilions, all with 6 mm-resolution screens. 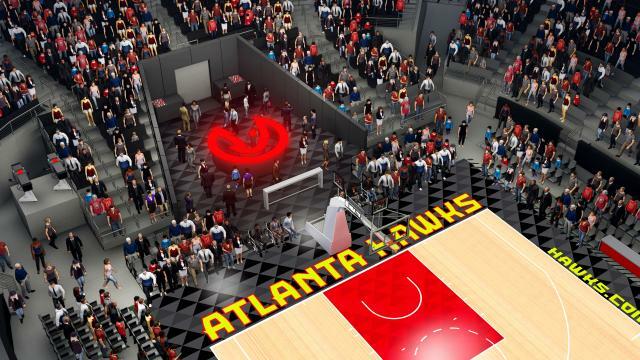 Even the courtside seats are getting an upgrade: Shaped like the team’s iconic Pacman-esque logo, the new Hawks Bar will sit just feet from the action as the first floor-level bar in an NBA arena. A new Courtside Club and Hawks Bar on the arena floor will be the first of their kind in the NBA. There will be even more opportunities for group gatherings, too. The arena will remove many of its original 20-person suites, replacing them with more modern and flexibile-sized suites, tailored for groups of all needs and sizes. Plus, businesses and larger gatherings can reserve the new Hawks Meeting and Conference Center, a 250-seat master conference room with four breakout spaces. Touch-screen technology, interactive whiteboards, and wireless presentation capability are conference center highlights, as is access to a full top-shelf bar. 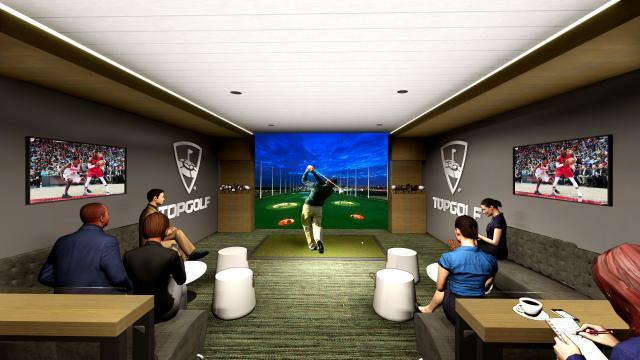 For an even more fan-focused group experience, check out Topgolf’s third Atlanta venture, Topgolf Swing Suites, which will also be in the conference center. The nationally-recognized entertainment brand is partnering with the arena to recreate the magic of its Alpharetta and Midtown locations inside the transformed venue. Rented by the hour, these 15-person suites will boast two Topgolf simulators, lounge seating, HDTVs, food-and-beverage service, and naturally, a stellar view of the arena. The goal in all of these updates is not only to entertain, but also to create a a unique ‘Atlanta’ experience for the more than two million visitors who pass through the arena’s doors every year. With the Hawks renewing its lease until 2048 and Atlanta continuing to grow rapidly, this center-city venue aims to better connect Atlantans with their sports, music, and each other. For a team celebrating its big 5-0, that’s a gold standard indeed.